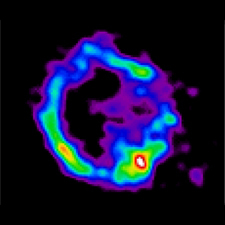 Chandra Image of Oxygen Ring in E0102-72. 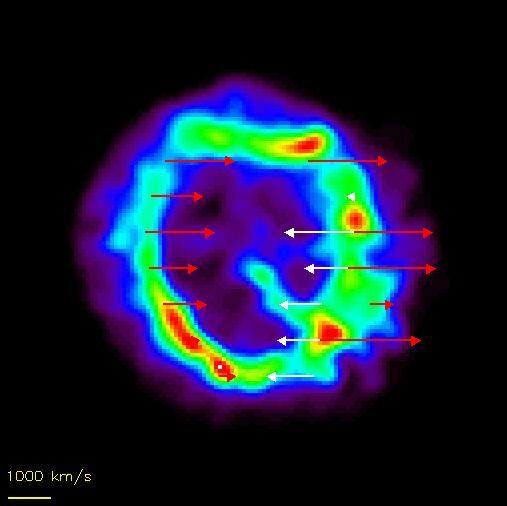 This X-ray image of the supernova remnant E0102-72 shows an expanding multimillion degree ring of oxygen that was created deep inside a massive star and hurled into space by the explosion of the star. The ring is about 30 light years across and contains more than a billion times the oxygen contained in the Earth's ocean and atmosphere. Images such as these provide unprecedented details about the creation and dispersal of heavy elements necessary to form planets like Earth. E0102-72 is in the Small Magellanic Cloud a small galaxy about 200,000 light years from Earth. Coordinates (J2000) RA 01h 04m 02.40s | Dec -72° 01´ 55.30"